This afternoon..S winds 15 to 20 kt with occasional gusts up to 35 kt, diminishing to 10 to 15 kt with gusts up to 25 kt late. Seas 2 to 4 ft. Slight chance of tstms. Showers. Vsby 1 to 3 nm. Tonight..S winds 10 to 15 kt with gusts up to 20 kt, becoming se 5 to 10 kt after midnight. Seas 2 to 3 ft. Showers likely, mainly in the evening. Sun..SE winds 5 to 10 kt. Seas 2 to 3 ft. Chance of showers in the afternoon. Sun night..S winds 5 to 10 kt, becoming nw after midnight. Seas 2 to 3 ft. Chance of showers. Mon..NW winds 5 to 10 kt, becoming W in the afternoon. Seas 2 to 3 ft. Chance of showers. Mon night..W winds 5 to 10 kt. Seas 2 to 3 ft. Chance of showers in the evening. Tue..W winds 5 to 10 kt, becoming sw in the afternoon. Seas 2 to 3 ft.
Tue night..SW winds around 10 kt. Seas around 2 ft. Chance of showers. 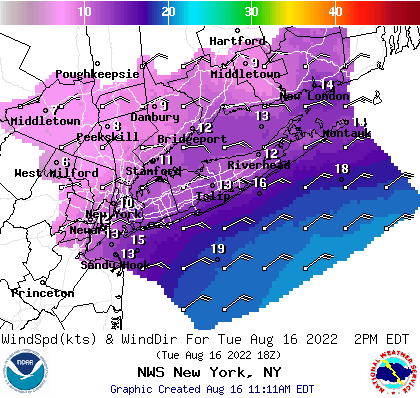 Wed..NW winds 10 to 15 kt. Seas around 2 ft. Chance of showers in the morning. 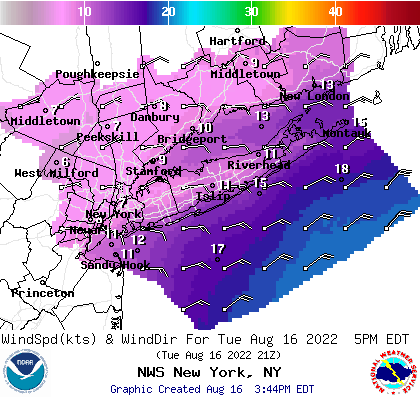 Wed night..N winds 10 to 15 kt. Seas around 2 ft. Winds and seas higher in and near tstms. Synopsis for the long island waters and new york harbor.. Low pressure slowly approaches from the west. This slow moving system does not exit until the beginning of next week. A cold frontal passage is expected during the middle of next week. cold frontal passage is expected during the middle of next week. high res models show this band shifting east, and weakening. Some adjustments to pops and wx were made. instability, lifting over this low level cap. higher readings away from the coast, and onshore flow. Sunday-Monday MVFR or lower in a chance of showers. Tuesday Vfr. Slight chance of showers late in the afternoon. Wednesday MVFR or lower possible in showers. threshold, seas will remain rough through tonight. Flash flood watch until 2 pm edt this afternoon for ctz005-009. Ny... 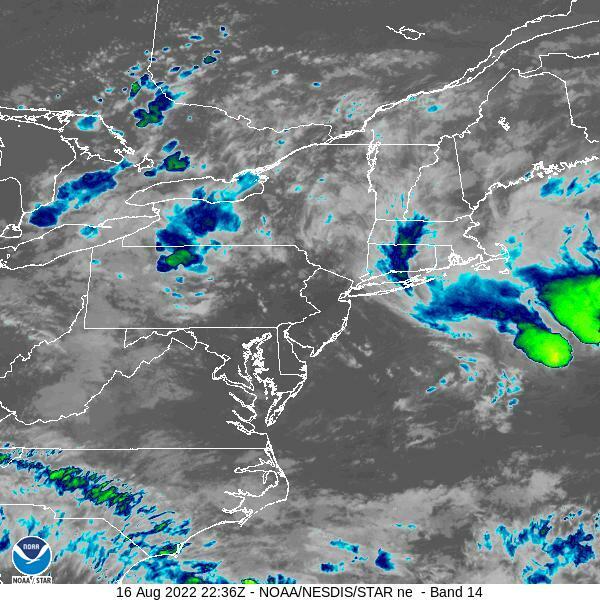 Flash flood watch until 8 pm edt this evening for nyz078>081.